It’s the only real estate-specific smart cloud. It designed for the homebuying and selling experience for agents and Consumers alike. Keller Williams has been busy building the Keller Cloud for the past few years so it will become powerful collecting the real estate technology tools from the ground up. The Cloud contains KW’s massive collection of agent, transaction and client data – giving the company an edge among competitors. It’s an innovation engine that allows agents to work smarter and more efficiently, a must in today’s fast-moving digital world. 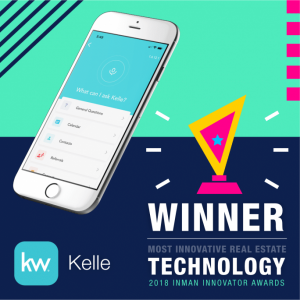 Keller Williams Artificial Intelligence app wins! Keller Cloud gets exciting because of this smart tool that is powered by artificial intellegence – coined Kelle. It has been providing agents more informed sights. So, how does the Keller Cloud get smarter? The more data pumped into the AI engine, the more insights the Keller Cloud can produce for agents, better helping them guide their clients through major real estate decisions. Data is both historical and real-time, taken from agent and consumer experiences. For example, offer information from KW’s agents are funneled into the Keller Cloud in real time. Kelle then scans this information for patterns and advises to the agent, along with recommendations on how to tweak the offer to increase the odds that it’s accepted. On the consumer end, KW’s technology will match clients to homes based on property features they’ve engaged with on video walk-throughs. Before the videos are presented to clients, KW technologists and agents tag certain features, like hardwood floors, allowing the AI to make sense of which homes have these specific attributes. By putting Kelle to work, consumers are served custom recommendations – which their agent can contribute to.